This luxury townhome is located in the gated Alii Cove Condominium complex and is a short walking distance 1/4 mile south of the town of Kailua-Kona. 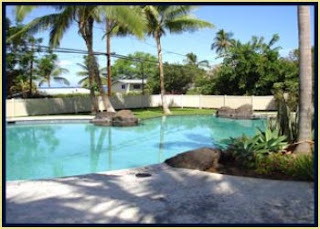 It is situated directly overlooking Honl's Beach with spectacular unobstructed views of the Honl’s Beach, the ocean, and cruise ships moored in Kailua Bay. During your stay, you will enjoy the benefits of a fully equipped 2115 sqft. luxury home with tropical appointments throughout. In addition, you will have access to the complex facilities including workout gym, pool, and spa. Additional townhome features include a fully equipped kitchen with stainless appliances, granite counters, and bar seating. The separate dining area has seating for six. The family room features a flat screen TV with DVR, home theater system, and iPod dock. The fully landscaped main level lanai overlooks Honl’s Beach. It has a gas BBQ and an outdoor table with seating for six where you can enjoy that morning cup of coffee watching cruise ships, surfers, or other activities in the bay or a late afternoon mai tai watching the sun set over the ocean.